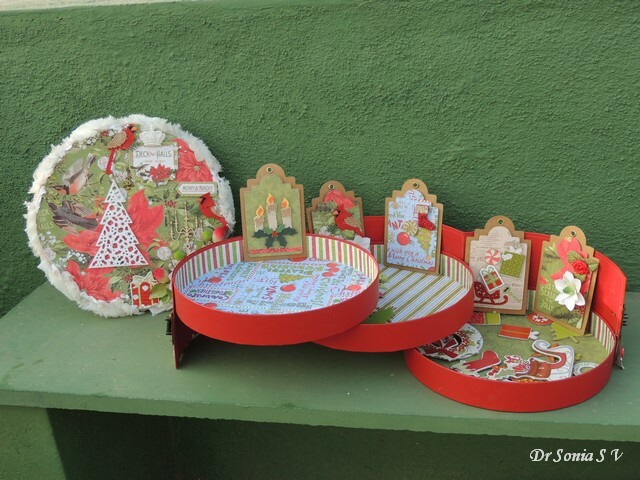 Hi friends, it's very ,very hot in Bangalore right now and I have not been crafting or blogging as my craft room with my computer is on the top floor of our house and it's literally a furnace there !! But I had to make a Christmas themed project for my DT post at the Rudolph Days Challenge and so here I am burning the midnight oil [because it's slightly cooler at night]!! My crafty mojo has been near absent and to try and rectify it I went craft shopping and picked up my first Graphic 45 paper packs!! Woo Hooo am I in love or what!!! I altered this box [ which housed chocolates gifted to us by a kind soul!] 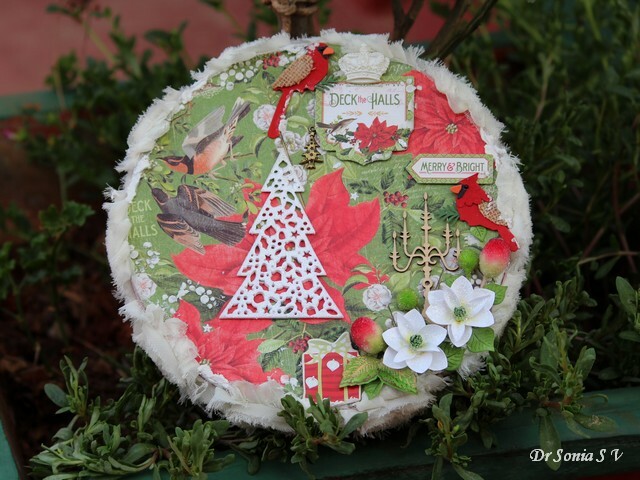 with my first Graphic 45 paper and added lots of my favorite elements including snow[ using whipped spackle ], cute birds, a chipboard candle stick and chipboard giftbox ! 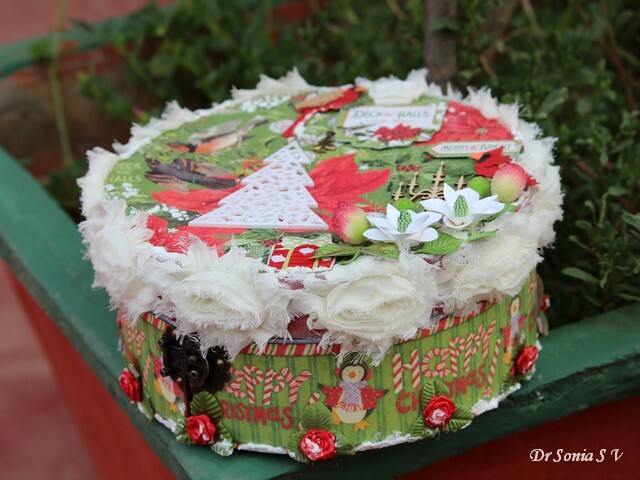 Added a gorgeous fabric flower trim [gifted to me by my crafter friend Remya] around the box decorated with cute penguins from the Debbie Mumm Harvest and Holiday paper stack. Loved adding a metal clasp to the box and tiny snow laden ribbon roses. I am in love with the Spellbinders Magnolia die and keep adding these handmade Magnolias to all my projects these days!! 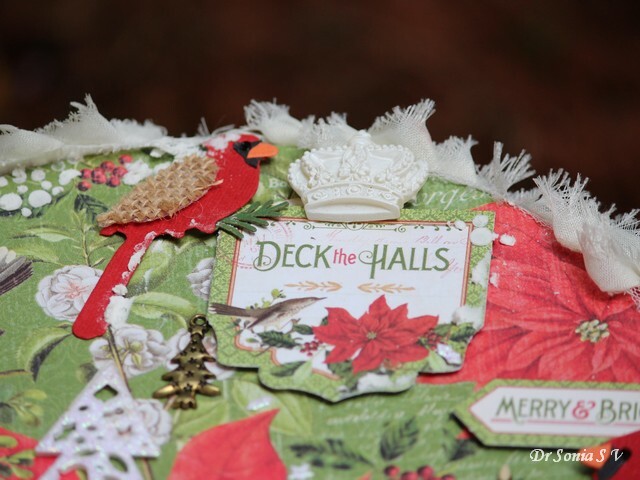 The "Deck the Halls" is an additional element from Graphic 45 and propped up on foam tape and dressed up with a gorgeous resin crown! 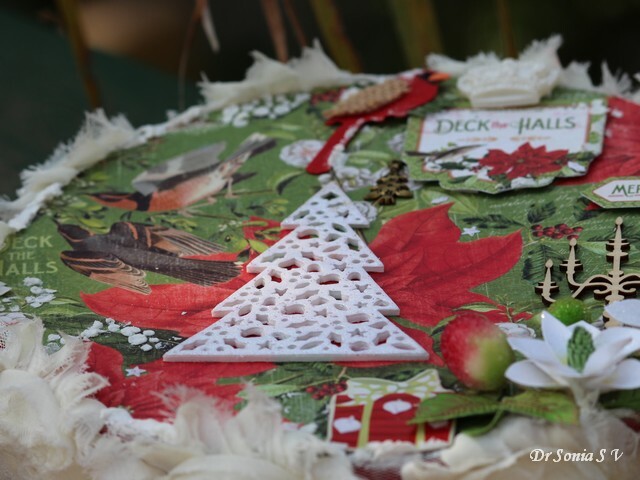 And now comes my absolute favorite part of this project...the glittering sparkling Cookie Cutter tree cut from foam and shimmering white paper using a gorgeous Poppy Stamps die gifted to me by the super generous Maureen the host of our Rudolph Days Challenge! 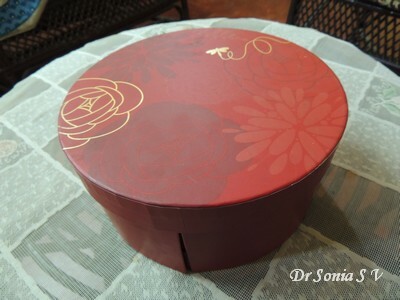 On opening the box..at first it looks like a regular box with handmade goodness inside! 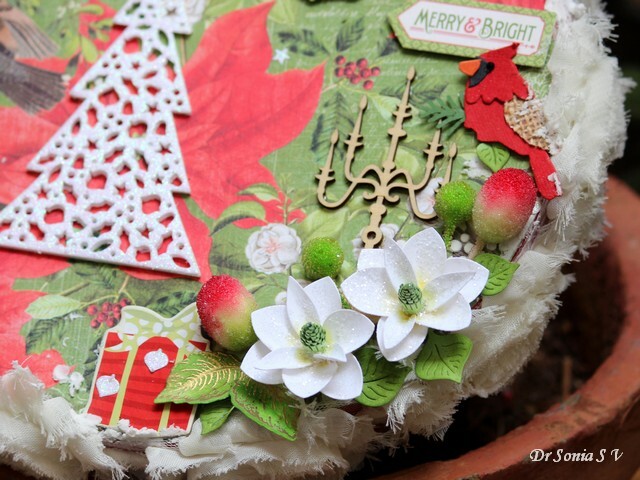 And hehe there are more magnolias and some gorgeous burlap sticker elements! 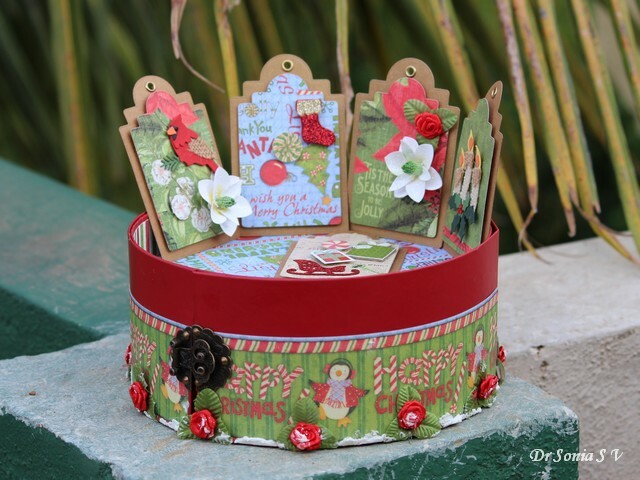 On unlatching the clasp on the box....voila...the box swings open into a 3 tiered gift box! 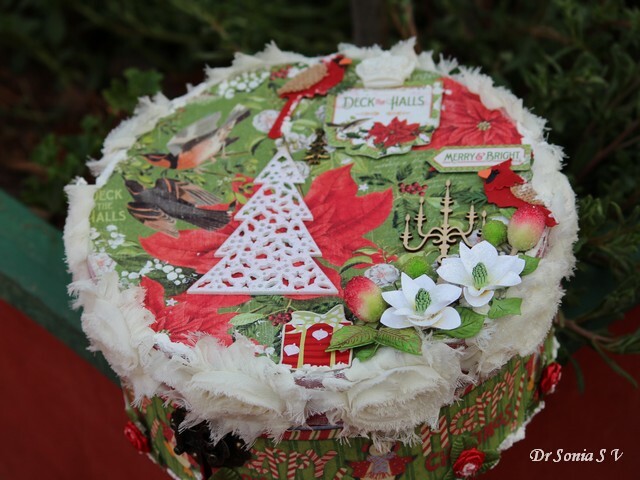 The box is sturdy enough to hold tags, decorative chipboard elements and chocolates!! 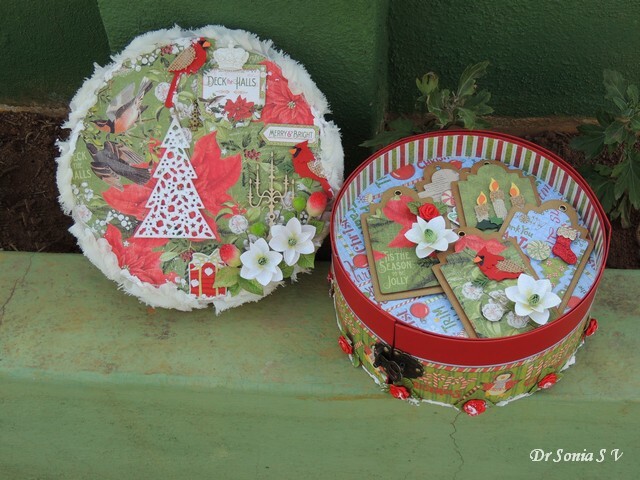 I had so much fun altering this box and I think it was just right to get my mojo back! When I am feeling more clever...I will whip up a Tutorial for you! !What do you say my friends....? 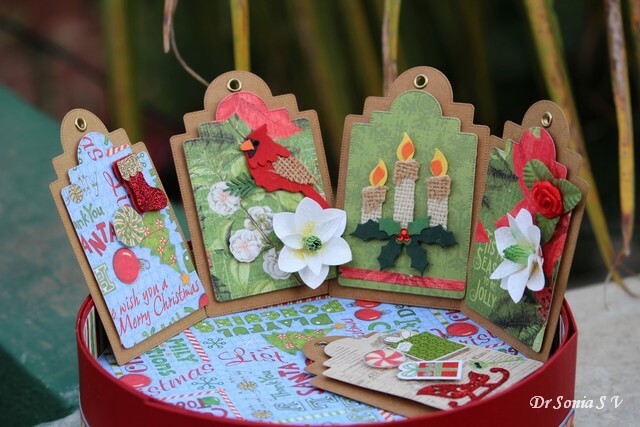 Dont forget to make and link up Christmas Projects to Maureeen's Rudolph Days Challenge ...she always has awesome prizes and the ladies who come to play there are so fabulously talented and friendly you wont regret it!!! 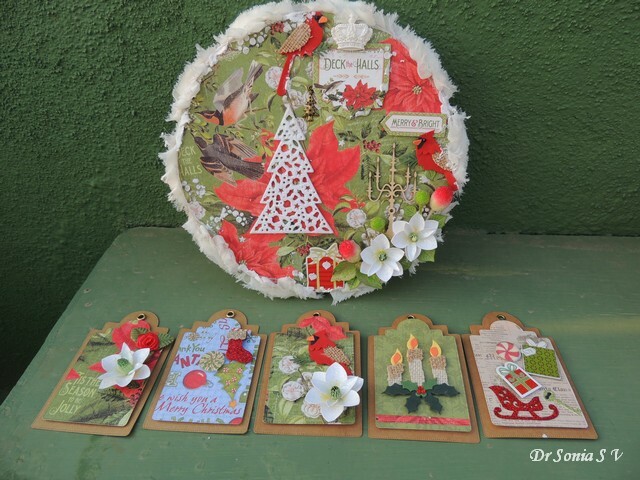 Poppy Stamps Challenge Gift it : I have made a special gift box with tags inside using Poppy Stamps Pinpoint Main Street Tags die and Poppy Stamps Cookie Cutter die. 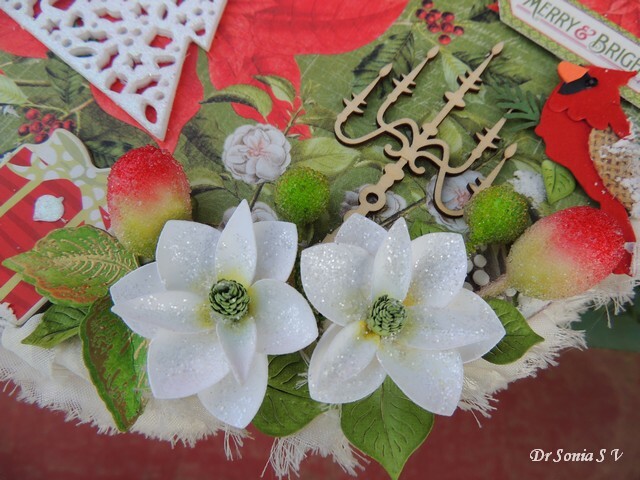 Pixie's Snippets Playground : Have used snippets of white cardstock to make all my magnolias and yes used snippets of the gorgeous Graphic 45 paper to make my tags! 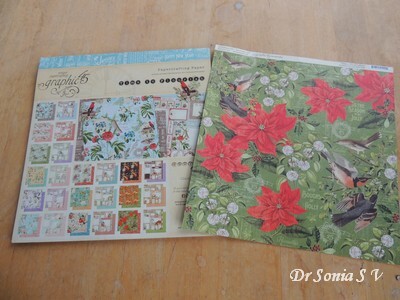 All sorts Challenge : B. I have interpreted as B for birds...lots of birds on my project ..on the gorgeous paper and the bird stickers . 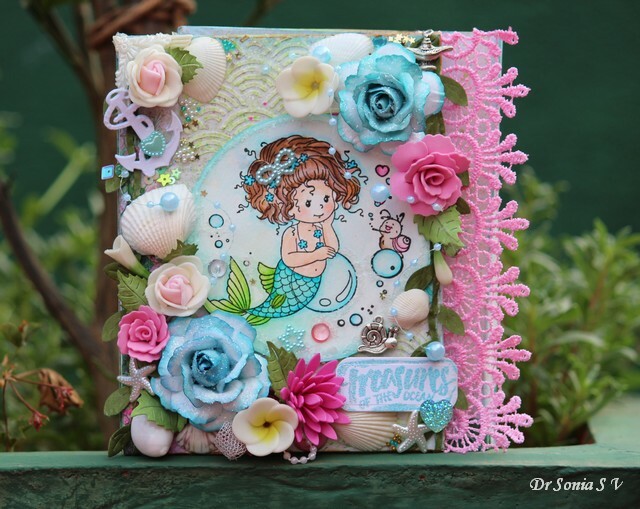 Hi friends, recently my family and I vacationed in Phuket , Thailand and we spent so much time in the oceans that for my DT post for Crafters Corner, I made a Mini Album in an Ocean theme with a cute water-colored mermaid, shells and various ocean motifs ! I love making flowers and this project has quite a few handmade flowers. 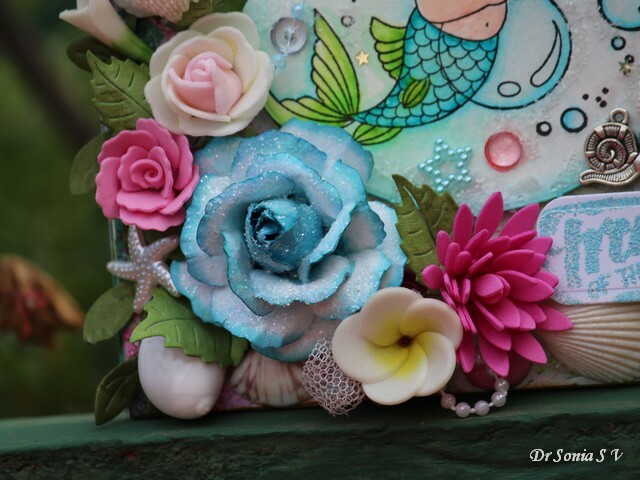 The big blue sparkling rose was made using Spellbinders Rose Creations die using this Tutorial : Easy Rose Tutorial . 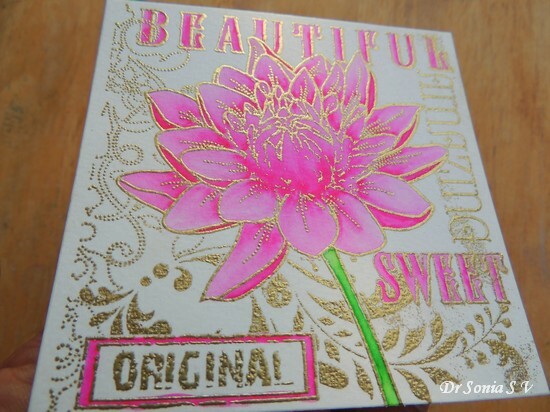 The Magenta Fluffy flower was made from craft foam and the Cheery Lynn Sun flower die using this Tutorial : Easy Daisy Tutorial and the Pink rose was made using craft foam and the Spellbinders Bauble Blossoms 1 die. I also added some handmade clay flowers [ the plumeria and the little white buds you see scattered around] made freehand using Thai Clay [ an air drying clay] and Oil paints. 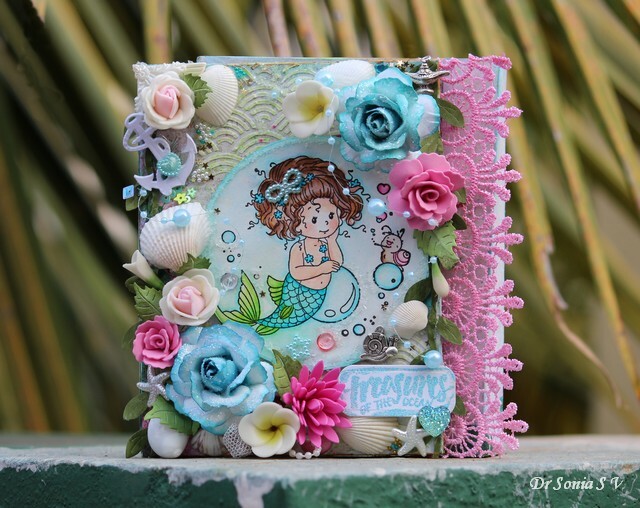 I love picking up shells from the beach and the shells on this mini album cover are shells I had picked up from our family holidays in Goa, Thailand and Malaysia over the years ! 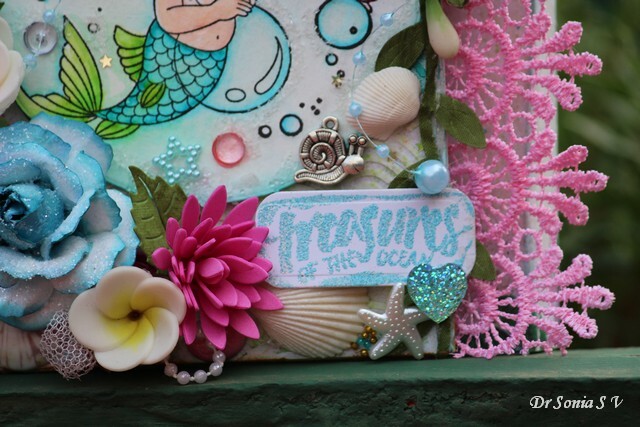 The Heat embossed " Treasures of the Ocean" is a stamp from Crafty Individuals [Cl 272] and such an apt one for this project! 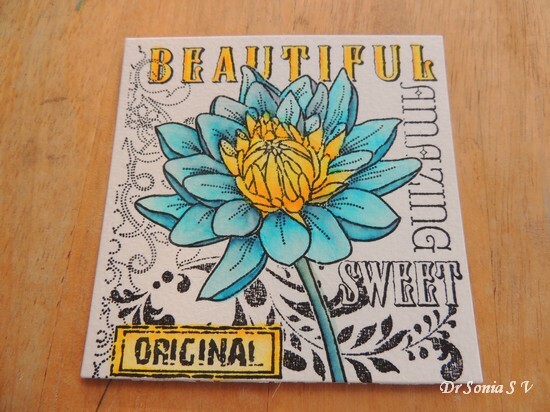 I made a mixed media style background using Ranger texture paste and a Carabelle Studio Geometry Stencil. Sprayed some Lindy's sprays and added tiny little pearls, turquoise blue glitter balls and golden star sequins! 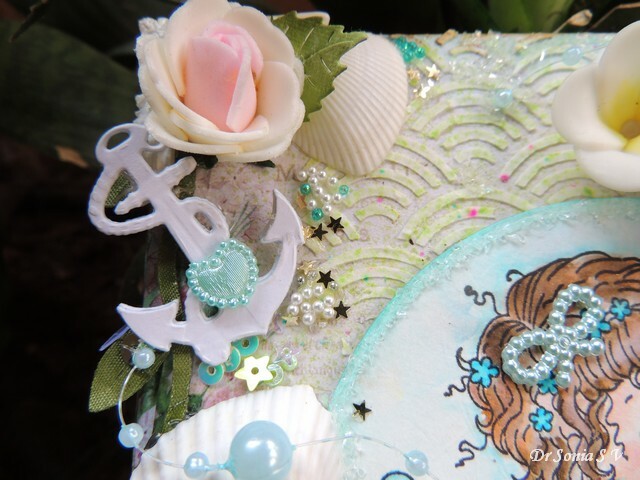 The anchor was cut using a Joy Crafts die. 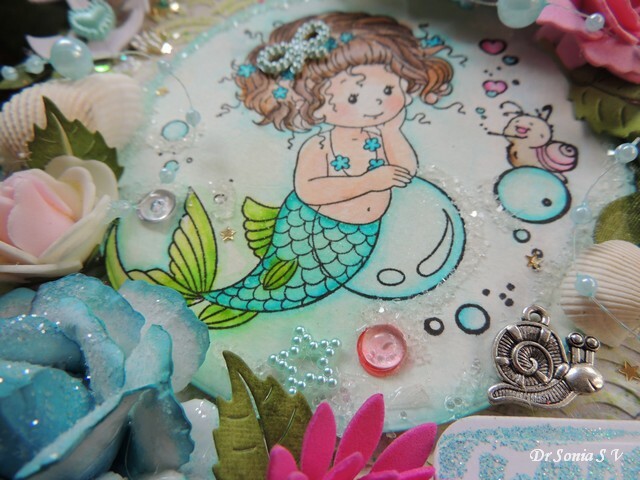 The little mermaid who is the star of the project has a magical sparkling background with diamond dust, golden stars, a pearl star and dew drops! And sharing more tips here. 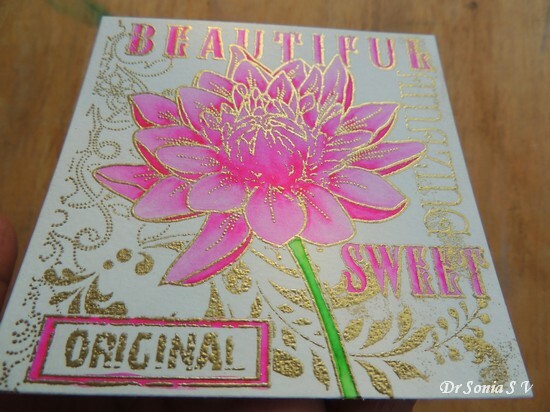 1.If you are not heat embossing your image,stamp it with an ink such as Versa fine which will not react and bleed with water! 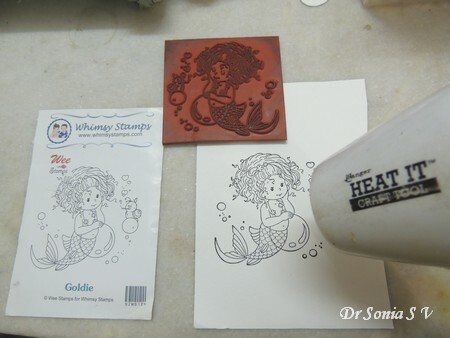 2.Allow enough time for the stamped image to dry before you water color or if you are in a hurry heat set it with a heat gun! 3.Download a color swatch chart like this one from Kuretake website or better still make a color swatch so that you wont have to keep trying pens to choose colors! 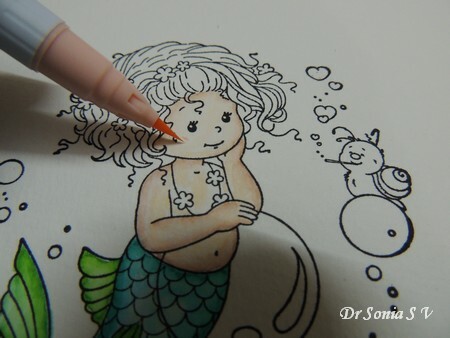 This is especially useful when you are coloring an animal or human image! 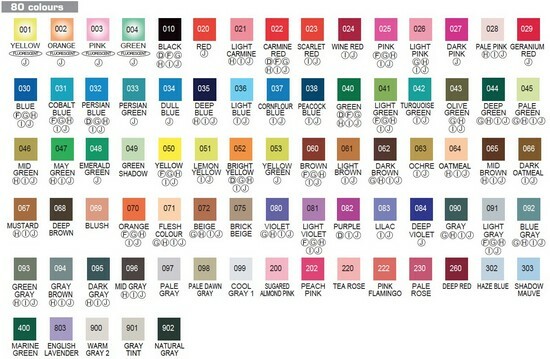 When making a color swatch make one grouping the colors together rather than in a chronological order! 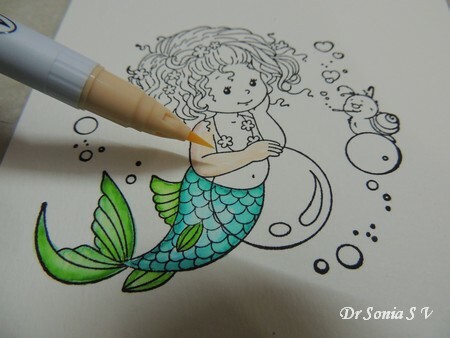 4.While coloring an image such as an animal or human using different shades of the same color, apply dark colors first and blend out with the water brush. 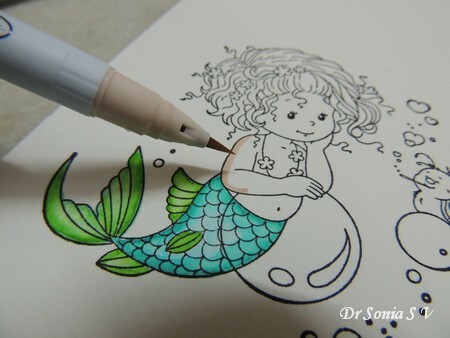 If you put dark colors later it is more difficult to blend without using more water! 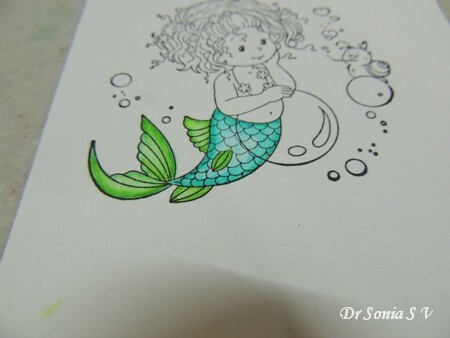 For the tail of this mermaid I used turquoise green[ No 42] first and pulled it inside with the water-brush.Later applied light blue [No 36] and blended it in nicely using the waterbrush again. Why I love the Zig brush pens compared to normal watercolors is that they are quite easy to use to create gradients and blends even for a beginner! To easily create a gradient blending of colors the trick is to know where to lay on the first brushstrokes first! 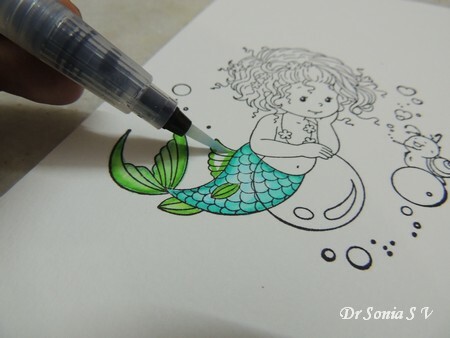 Pull in the colors using the water brush! This is one of the easiest ways to get a fading away of a color! Here I have used just a singe color- May Green [No 47] and got a beautiful gradient effect by pulling in the colors using a water brush! 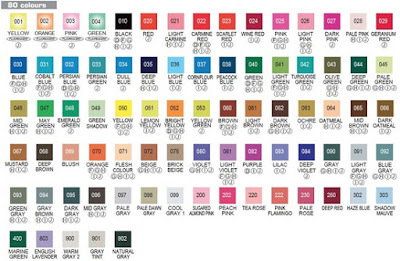 7.Coloring Skin Tones - I think you will all agree coloring skin is always challenging to a beginner. The Zig brush pens are available in a beautiful range of shades of browns and grays and pinks . 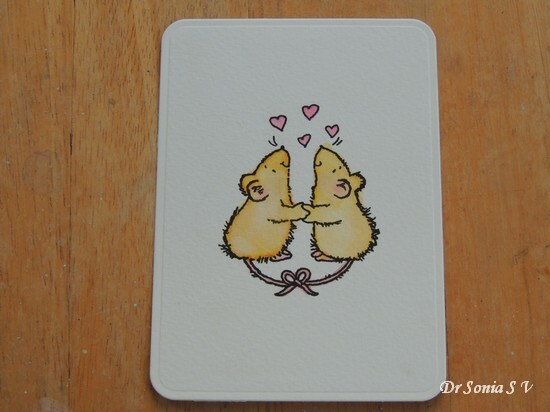 You can add life to your animal and human images by adding a bit of color to the cheeks using Tea Rose [No 220] or any shade of pink..... Just add a tiny bit of pinkish color and blend with the water brush! 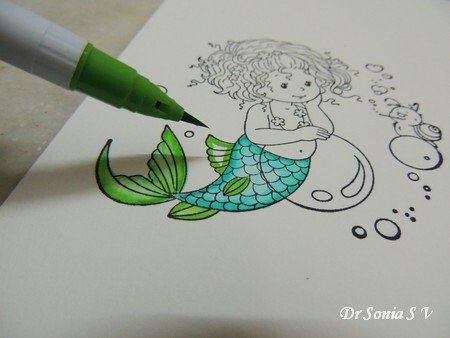 8.While water-coloring tiny areas such as the flowers in this mermaid image use the brush pens directly and use very little or no water as it can bleed easily! Coloring hair is always tricky no matter what coloring medium you use...the only thing I can say is before I got my Zigs the hair of my colored images was a big blob...now its much much better!! 10.Last Tip is that if you don't get good results with your attempts try changing the type of water brush you are using and/ or the type of watercolor paper you are using! 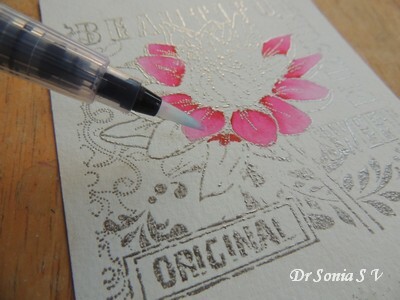 There is no right or wrong product...just that one type of brush or paper might work better for you! 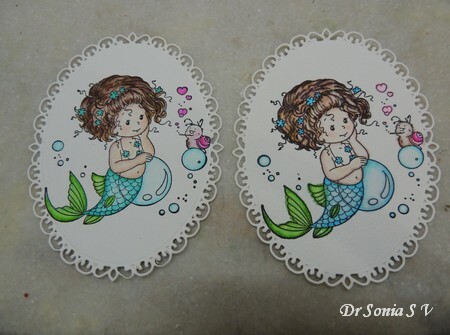 When I worked on floral or freehand water coloring I didnt notice much difference in water coloring on different water color papers but for this intricate mermaid stamp I found that I had poorer control on the Brustro paper.On Brustro the pigment had a tendency to spread more on adding water , bled outside the lines quite a bit and had a splotchier look on layering the colors. 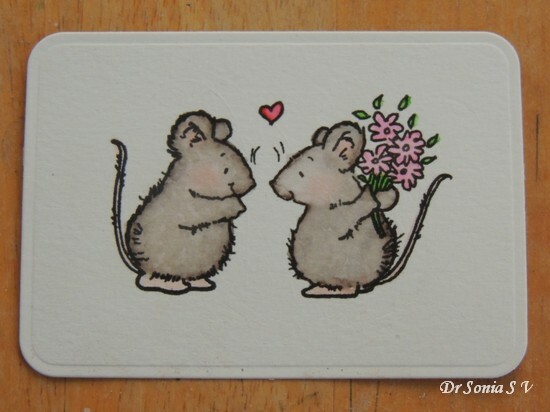 The colors were however more vibrant and rich on the Brustro Paper and lovely for freehand water-coloring. 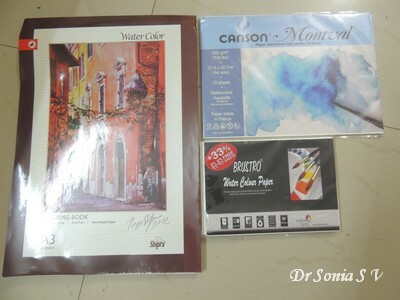 So the main point is to experiment with different brands of watercolor paper if you are not happy with your attempts! 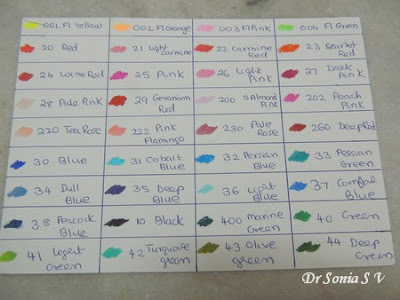 I am not an expert at water-coloring but my coloring skills have improved tremendously after I got the Zig brush pens and I do hope some of these tips will be helpful if you have or are planning to buy these amazing watercolor pens! 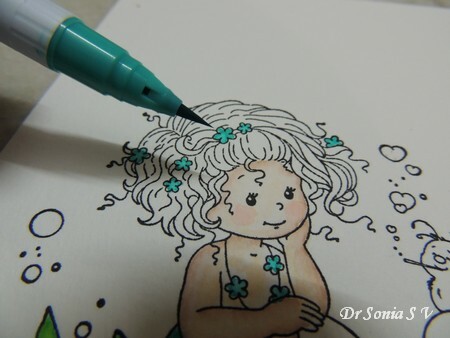 Hi friends, it gives me great pleasure to write a post on the amazing water-coloring Kuretake Zig Clean Color Real Brush Pens . These amazing watercolor brush tip pens from Japan are all the rage in the paper-crafting industry and are available in different sets to suit your budget. So you can pick up a set of 12 to experiment and see if you like it , buy individual colors or splurge and go all the way and buy the complete 80 set! What are Kuretake Zig Clean Color Real Brush Pens ? 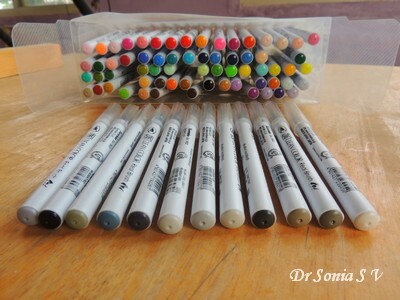 These are watercolor pens with tips in an actual brush format and the brush is of such high quality that you can get fine lines as well as broad brush strokes. 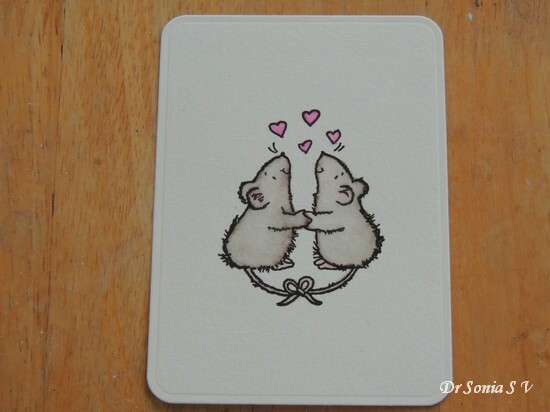 Why are they so popular in the paper-crafting industry? 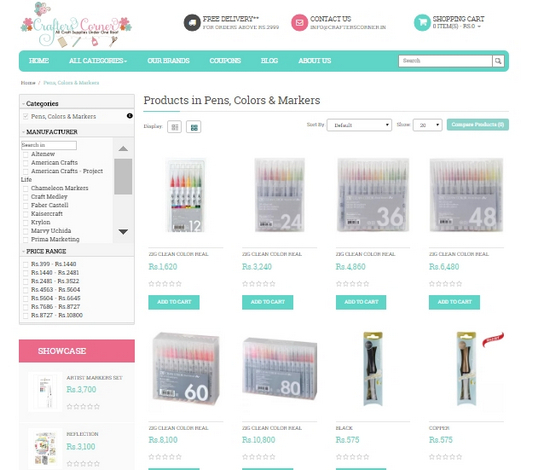 Amazing range of colors with fabulous shades of grey and brown especially useful to color cute animals . Very high quality- these pens don't leak , brushes stay good even with rough use and the pens as such last a long long time ! Though these watercolor brushpens can be used on their own to color , the charm of the pens can be best appreciated if you use water with them either using a normal brush or a water-brush . So the important thing is don't give up if something doesn't work for you...keep trying to find out what clicks for you! 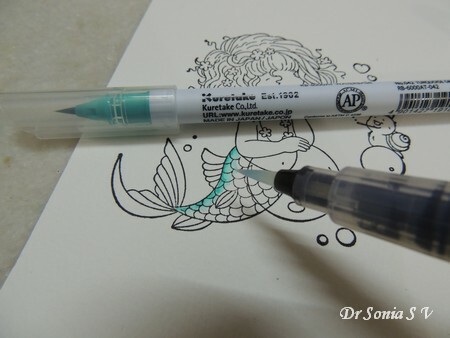 you can touch tips of the pens to blend two colors and use one pen to color the image! 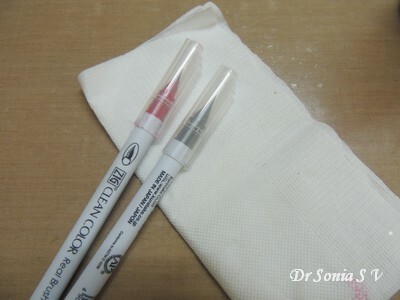 I just have to mention this as a tissue paper/ paper towel is indispensable while water-coloring with these pens. 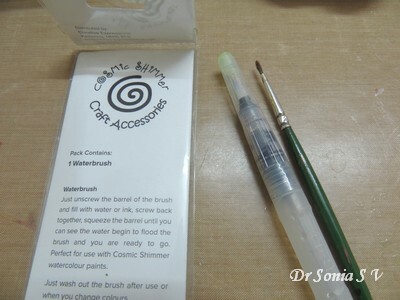 You can use it to wipe your water-brush tips to remove a bit of ink or use it directly to lift pigment off your colored image while the paper is wet ! There are beautiful videos by experts in coloring on how to use Zigs in rather elaborate ways to achieve fabulous results. I will share with you tips on how to use just the minimum of supplies[ meaning a limited palette], with the least effort and time to get lovely colored images! Tip 1 : When you are starting with Zigs start with a large flower image...these are the easiest to color and get good results without a lot of effort! 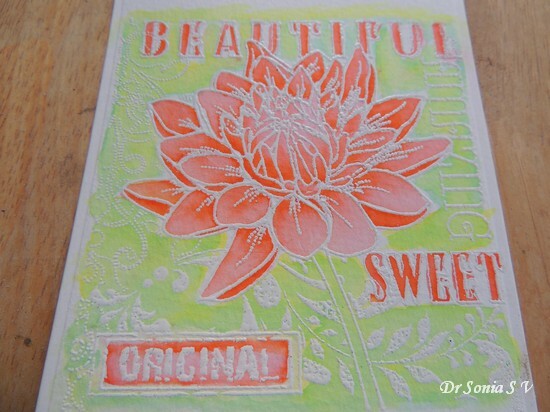 Here I have used a Penny Black Cling Rubber Stamp called "Sweet Dahlia"
Tip 2 : the tricky thing about water-coloring is controlling the flow of colors.Heat embossing your image in a vibrant gold or other striking color allows you to let your color pool in areas and work your way more easily! Tip 3 : Start using just a single color as you don't have to worry about perfectly blending colors!Here I used "Pink" Zigs Brush pens and used the water brush to achieve the gradient shading of color. 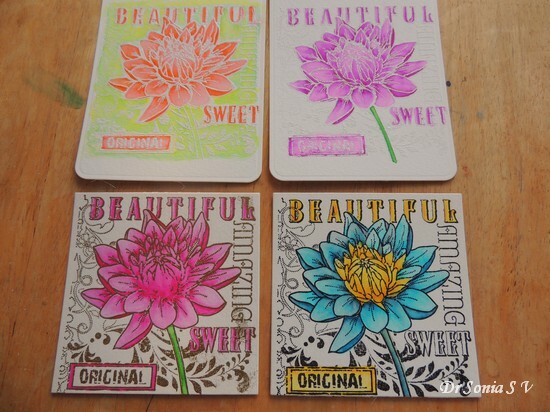 Tip 4 : Let the lines of the stamped image guide you in deciding where the color needs to be the darkest.Mind you I am no coloring expert and I don't have the patience to sit hours coloring but even I could create beautiful vibrant flowers in minutes! 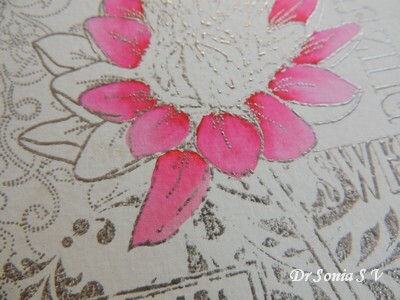 Tip 5 : White Embossed Images are more tricky to color as its difficult to see where the lines are! 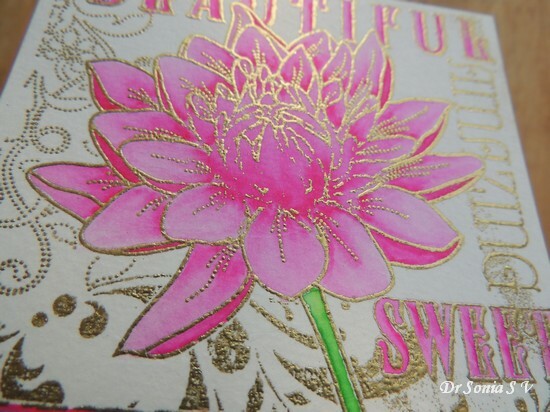 So once your confidence builds then plunge into coloring white embossed images but the vibrancy of zig colors looks so good against the white background that most mistakes are muted! 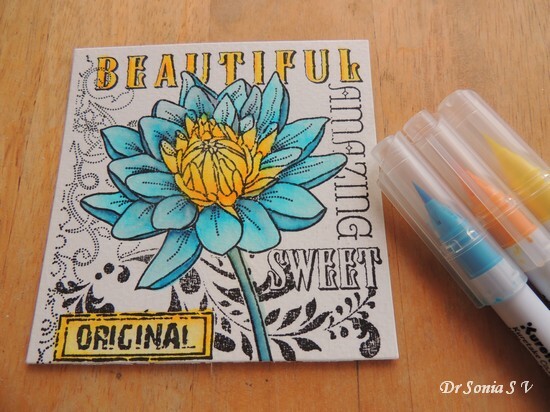 The flower below was also colored using a single color! 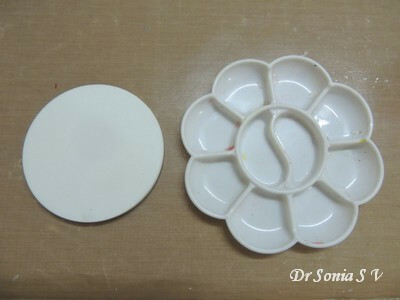 Apply a dark color to the base of the petals or other area where you want the color to be the darkest. Just apply a thin line of color. Dont let it dry but bring your water-brush into the are and go over the whole line first. 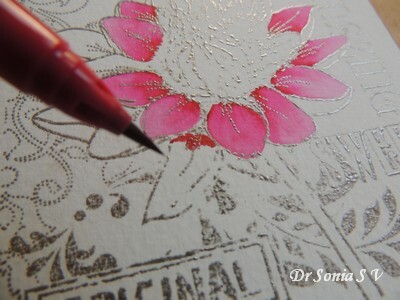 Then pull the colors outwards to easily achieve a beautiful gradient shading of your flower petal! If you feel the colors are dark as you pull the brush...wipe the brush on the back of your hand [ a paper towel will remove more ink so I prefer the back of my hand!] and continue pulling ink outwards! Easily create background washes using different Zig colors. 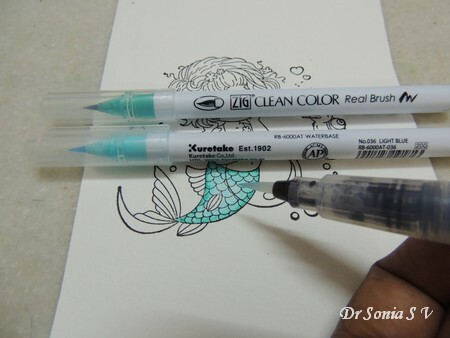 Either use the pens to blend into each other or use a brush pen to pull colors into each other. A background such as this with texturing is perfect to hone your skills in blending 2 or 3 colors as the blending need not be perfect to give gorgeous results! 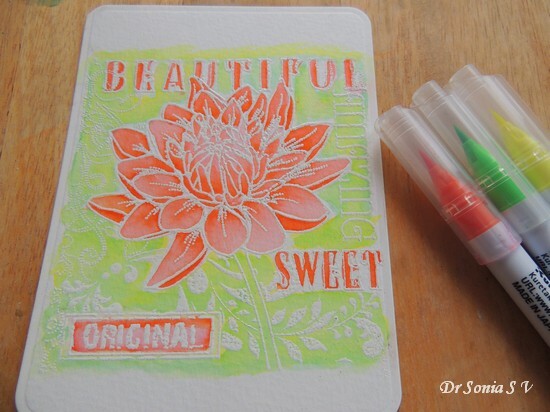 Here I used Scarlet red [ yes it looks like orange] on the Dahlia and a blend of fluorescent yellow and green on the background . 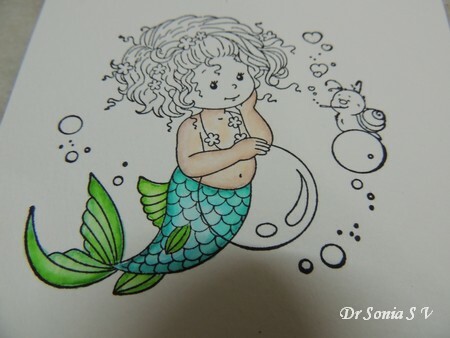 Tip 8 : Watercoloring an image stamped in normal black ink [ use a waterproof ink such as Versafine] will be frustrating when you begin using watercolors for the first time as the colors may bleed and smudge into areas you didn't want it to ! As you can see the accidental creation of a bit of "green" by the yellow and blue mixing in the center of my dahlia! So if coloring simple stamped images frustrate you switch to embossed images till you get better control over the brushes. I hope the tips I have shared for crafters starting with Zigs will be useful. 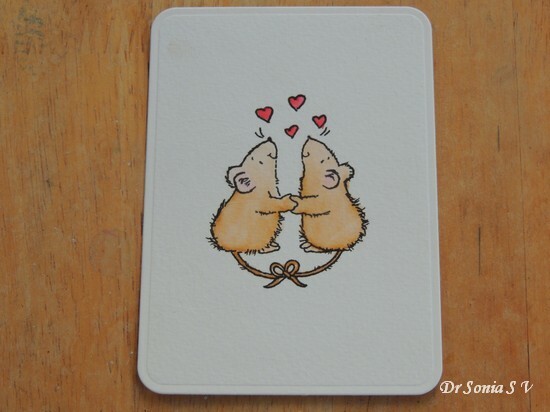 Sharing a few more images to show just how amazing these brush pens are! 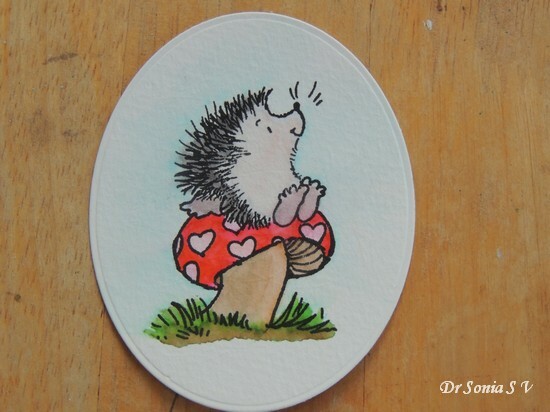 Zig Clean Color Real Brush Pens are simply amazing to color cute animals as there are beautiful shades of grey and brown and face colors to achieve the perfect shading! 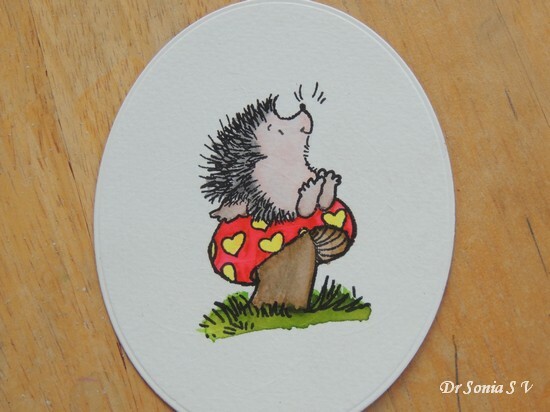 The hedgehog from Penny Black " critters in love" was so easy to color! 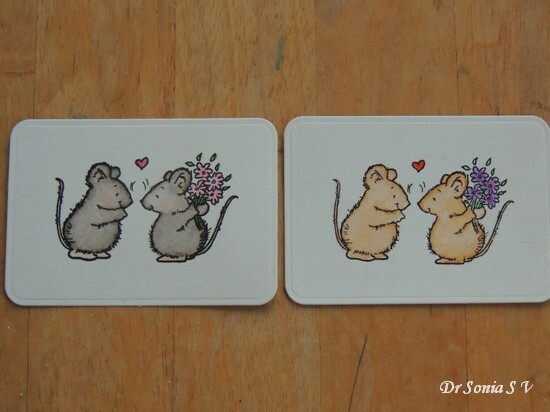 The cute little mice are also from the same stamp set and here you can see just how lovely the shades of brown and grey are. I was able to achieve a lovely fur effect using stippling with several shades of grey colors! The best thing about zig brush pens is that you can really layer on the colors if you are in the mood for some in depth coloring or just quickly whip up a batch using single color shades!! 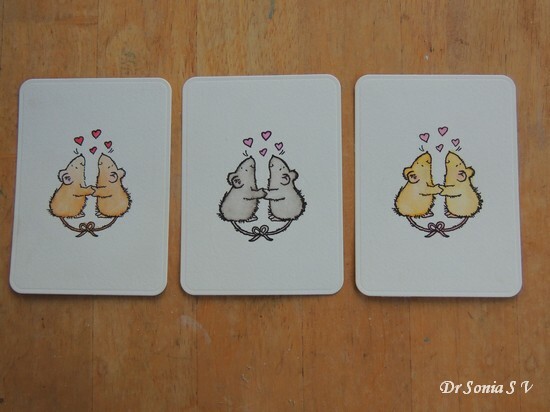 The 3 images of the little mice holding hands were all achieved using single color shades! 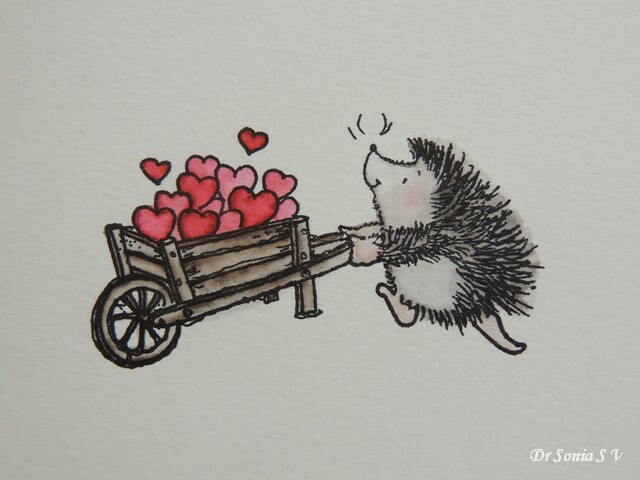 And finally here is love from a hedgie colored using many shades of grey and a single shade of red to achieve a 2 tone look to the cartload of hearts !! 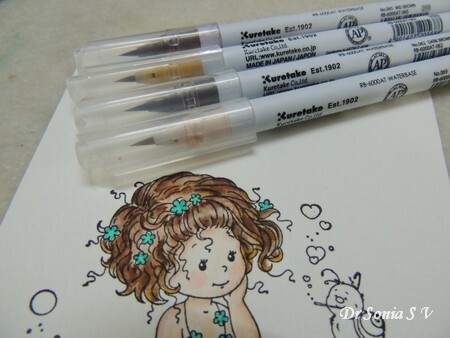 I hope you enjoyed this glimpse into Kuretake Zig Clean Color Real Brush Pens !! 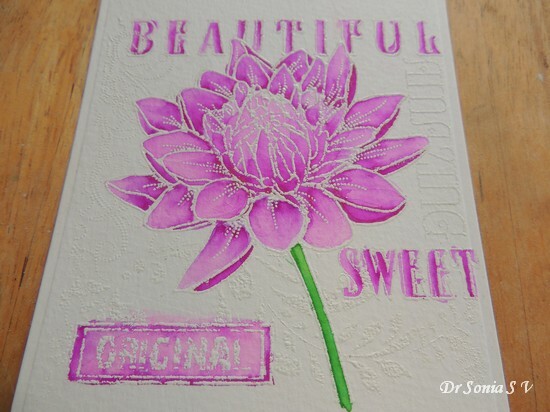 Stamping Supplies : Versafine Black Ink. 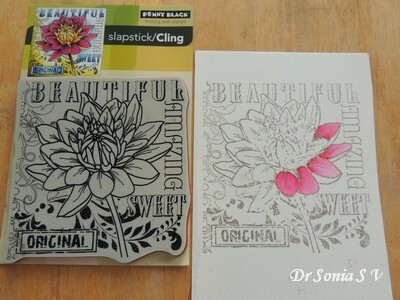 Stamps : Penny Black " critters in love",Penny Black Cling Rubber Stamp "Sweet Dahlia"